Making tortillas is hard. My mom told me that once many years ago. She can make pretty much anything, but these were her nemesis. I should have taken that into consideration when I decided to try and make my own. You see, I buy these corn and whole wheat blend tortillas at the grocery store and they ain’t cheap! Over $2 for 8 tortillas. That’s highway robbery, friends. 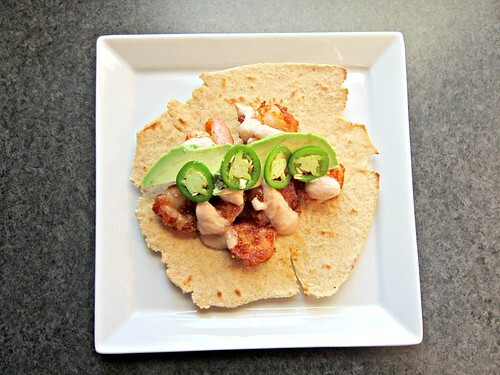 So, I decided to see if I could make them myself alongside these yummy shrimp tacos. As you can see in the pictures, they are a far-cry from picture-perfect. Don’t get me wrong, they tasted just fine. But, I will refrain from sharing the recipe with you until/unless I perfect them. Despite how thin I rolled them out, when I warmed (cooked?) them on the griddle, they puffed up a little and were a little less floppy (pliable) than I think they should be. So…I need to tweak and toy with the recipe I used to see if I can get them right. Until then, it’s back to highway robbery tortillas from the grocery store. And shrimp tacos. We can’t forget about these shrimp tacos!! When I originally planned this meal, I thought I had already made (and blogged) these tacos, so the post was actually going to be the tortillas. Good thing I was wrong, and I haven’t posted these babies before, because the intended post didn’t work out as planned! I’m not sure if it was the shrimp, the sauce, the garden jalapeno, but these definitely had a super spicy kick to them. I’m 99.9999% sure it was primarily the jalapeno. I ate my tacos first, so I was aware of the kick, and I have to admit that I got a leeetle bit of enjoyment out of watching J eat his. He likes spicy food just as much as I do, but it was even getting to him. I think he put a lot of jalapeno slices on his. Oops! Taste your sauce when you make it and adjust it by adding more chipotle or more Greek yogurt if you need to tone it down a bit. I don’t think you will need to, though, just be careful with the jalapenos! In a medium bowl, stir together the flour, chili powder, salt and pepper. Add the (patted dry) shrimp and stir or toss to combine. Heat a large skillet over medium heat, add the butter and melt. Add the shrimp and cook fora couple of minutes, allowing the bottom to get crispy, then stir and cook another minute or two until cooked through. Meanwhile, combine the yogurt, chipotles and sauce, and lime juice in a blender or food processor and blend until smooth. 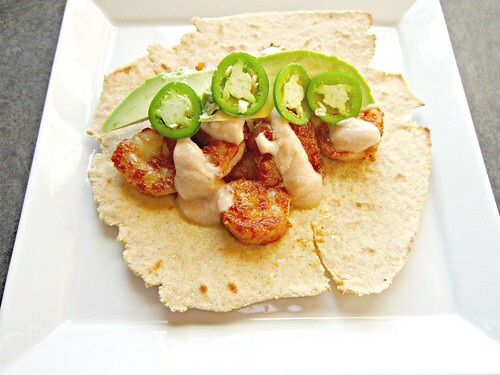 To assemble, warm your tortillas and top with shrimp, sauce, a few avocado slices and a few jalapeno slices. It’ll be a nice spicy kick in the mouth! I do love me some taco Tuesday!